My Craigslist Roundups have evolved into mini-“The House that Craigslist Built” sessions. What do you think of the change? This week I feature a living room that I think my design hero, Emily Henderson, would appreciate. 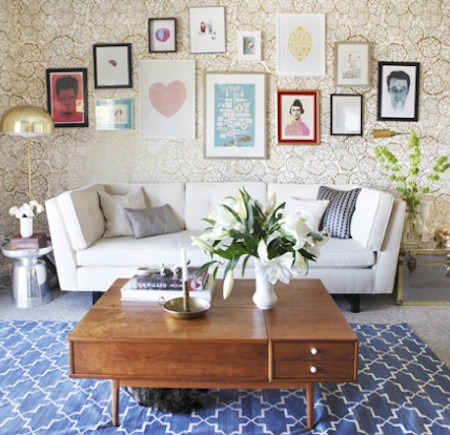 This week I just said no to the tufted velvet sofas in favor of a more modern look. (I’m trying to be diverse.) I couldn’t avoid the quirk entirely, however, and I ended up channeling one of my design heroes, Emily Henderson. Emily Henderson won a design competition on an HGTV reality show called Design Star a few years back. She’s also a blogger and stylist, and now a designer and TV show host for a show called Secrets From a Stylist, which I LOVE. My first “room” today is straight up Emily Henderson. Well, I think it is, anyway. I don’t know what she would say! But if you look at her living room, she uses navy, brass, white, wood, and leather for her major pieces, and then brings in all the fun pops of yellow and bright pink (and other bright colors) through accessories. My imagined rooms have no accessories of course, so you’ll just have to imagine spots of pink and yellow throughout this first living room! Now, onto the Craigslist Roundup! Start with an actual Danish, midcentury modern sofa. Pair it with a reproduction of a midcentury modern coffee table (made by IKEA’s fancier line, “Stockholm”), which is nice and long—necessary for that couch. Center the seating around this rug, which you’ll need to layer over a larger (perhaps sisal) rug. Opposite the sofa, place these two high gloss Louis chairs from Four Hands. Group the chairs around this vintage brass table, which does come with a glass top—it’s just not shown here for some reason. And mount this handsome guy (made out of resin, from etsy) above your sofa, perhaps along with some other, more colorful art. If there’s room in the living room, place this desk against a bare wall, or perhaps backed up against the sofa (if you’re floating the sofa in the middle of the room). And replace your boring overhead living room light with this beauty. OK, next up we have an entirely different type of style: contemporary. That is a word that usually makes a little unhappy shiver run down the back of my spine, but I’m including it here because a) I know a lot of people love it, b) this room is a good value, and c) I like the colors. This person is selling the couch (with two of the throw pillows shown), the chair, and that cool ikat-patterned rug. All for $850. Use this shiny silver pedestal table from Four Hands off to the side. I have been wanting this thing for years! But sadly, this was one of my husband’s vetoes. When the spouse vetoes, what can you do? Now, if your bar is visible from your living room like it is in the home of the couch/chair/rug, then these seagrass bar stools will look amazing. And if you need a breakfast table nearby, here you go. I normally don’t really dig iron beds, but I am LOVING this one because of its aged patina and its Moroccan design. And I am particularly in love with the art deco styling (and twin butterfly pulls!) on this pair of Tiffany-style lamps, which can flank the bed. Here is a tiny iron and glass (with birds!) table to go on one side. And a painted cabinet to serve as a sort of trunk at the base of the bed (which is especially necessary since this bed has no footboard). If there’s enough space in your room, please rescue this neglected burled wood and leather inlay desk from its over-teched owners; it looks like it would shine up beautifully. That was fun! What do you think, are you liking these posts being grouped into rooms like this? What were your favorite pieces this week? Could you see yourself ever hanging a deer head (even one made out of resin) over your couch?